Uroleucon aeneum apterae (see two pictures below) are shiny metallic bronze-black. The third antennal segment has rhinaria extending over 0.37-0.52 of the length. The apical rostral segment (RIV+V) is 0.23-0.26 mm long. Antesiphuncular sclerites are absent. The tibiae are dark but with a paler dusky middle section, and the hind femur is dark on the distal 0.4-0.5 (cf. Uroleucon cirsii which has mainly pale legs that are only darkened towards the apices of the segments, and Uroleucon jaceae which has tibiae totally black). The siphunculi of Uroleucon aeneum have reticulation on the distal 0.15-0.20, and are 1.4-1.8 times the length of the cauda. The cauda is wholly dark (cf. Uroleucon cirsii which has a slightly dusky yellow cauda). The body length of the adult Uroleucon aeneum apterae is 3.0-4.3 mm. Both images above copyright Brian Eversham, all rights reserved. The alate viviparous Uroleucon aeneum female is much like the apterous viviparous female, but has well developed antesiphuncular sclerites. Antennal segment III has 50-68 secondary rhinaria. The apterous ovipara is similar to the apterous viviparous female, and the alate male has a dark green body with black spots. Uroleucon aeneum lives in sometimes very large colonies on the upper parts of stems of thistles, mainly Carduus species, but also on some Cirsium species. 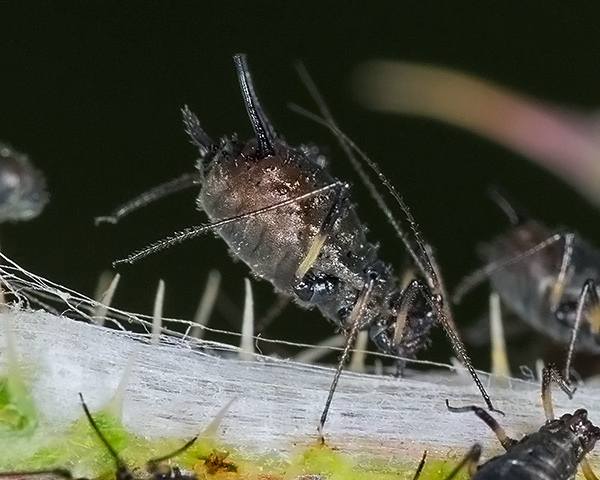 The dark-tailed thistle aphid does not host alternate, but remains all year round on thistle. Oviparae and alate males appear in September. Uroleucon aeneum is found throughout Europe to Turkey, Armenia, Kazakhstan and Siberia, and has been introduced to Argentina and Chile. Uroleucon aeneum seems to be one of those species that thrives in roadside habitats. The image below was taken of a nodding thistle plant (Carduus nutans) at the roadside in Suffolk, England. Image above copyright Brian Eversham, all rights reserved. Basky (2016) looked at aphid species colonizing perennial Asteraceae species along Hungarian motorways. Uroleucon aeneum was colonizing welted thistle (Carduus acanthoides), whilst Uroleucon cirsii was present on bristly hawksbeard (Crepis setosa) and hawkweed oxtongue (Picris hieracioides). Moran (1986) suggested that Uroleucon aphids have adapted morphologically to the different selective regimes, imposed by certain characteristics of the plant surface, to give rise to the large number species we see today. 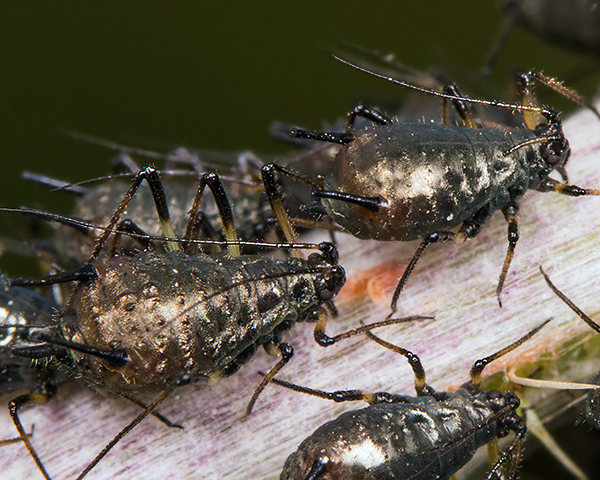 Those characteristics, including prickles, hairs, glandular hairs, scales and papillae (known collectively as trichomes) are known to affect feeding success of aphids. Members of the Asteraceae vary greatly, even within a genus, in trichome structure and abundance, from glabrous (=smooth) surfaces, to those which are densely pubescent with short hairs, to those which have long glandular hairs. Moran demonstrated that the principle that 'the hairier the plant surface, the longer the apical segment of the aphid rostrum' also applies for members of what the author describes as 'the Uroleucon aeneum complex'. Uroleucon aeneum has been recorded from 15 Carduus species, 7 Cirsium species, also from Carthamus dentatus, Carthamus lanatus, Cnicus benedictus, Galactites tomentosa, Onopordum acanthium, Onopordum illyricum, Silybum marianum, plus Scolymus and Sonchus species (unidentified). 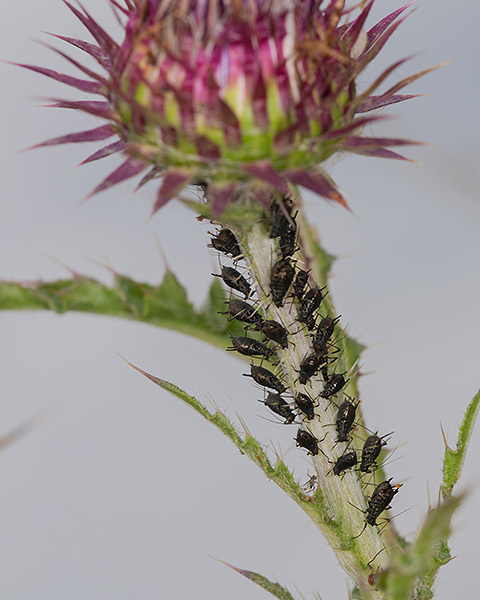 Aside from a few polyphagous aphids, Blackman & Eastop list 29 aphid species as feeding on Carduus thistles worldwide, and provide formal identification keys. 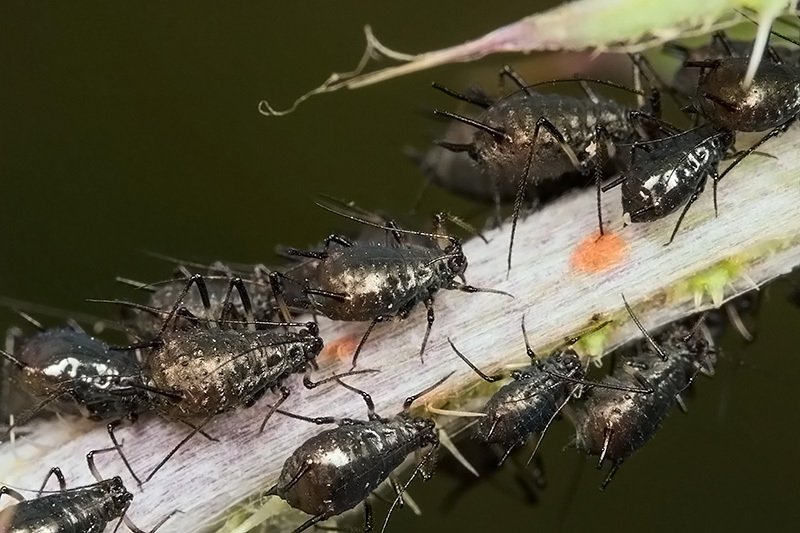 Of those aphid species, Baker (2015) lists 13 as occurring in Britain: Aphis fabae, Aphis gossypii, Aphis solanella, Brachycaudus cardui, Brachycaudus helichrysi, Brachycaudus lateralis, Capitophorus carduinus, Capitophorus elaeagni, Pemphigus bursarius, Protrama radicis, Trama troglodytes, Uroleucon aeneum and Uroleucon cichorii. Blackman & Eastop list more than 55 species of aphid as feeding on Cirsium thistles (also Cnicus) worldwide, and provide formal identification keys. Of those aphid species, Baker (2015) lists at least 27 as occurring in Britain: Acyrthosiphon malvae, Aphis craccivora, Aphis fabae group, Aphis gossypii, Aphis solanella, Aphis spiraecola, Aulacorthum solani, Brachycaudus cardui, Brachycaudus helichrysi, Brachycaudus lateralis, Capitophorus carduinus, Capitophorus elaeagni, Capitophorus gynoxanthus, Dysaphis lappae ssp. cirsii, Hyperomyzus lactucae, Macrosiphum euphorbiae, Myzus ascalonicus, Myzus cymbalariae, Myzus persicae, Nasonovia ribisnigri, Protrama radicis, Trama troglodytes, Uroleucon aeneum, Uroleucon cirsii, Uroleucon erigeronense and Uroleucon jaceae. Our thanks to Alan Outen of the Bedfordshire Invertebrate Group for earlier photos of Uroleucon aeneum, and to Brian Eversham of Bedfordshire Wildlife Trust for the photos currently used above.